BLUE BELL, Pennsylvania (CNN) -- Janice McFadden's story hardly stands out. 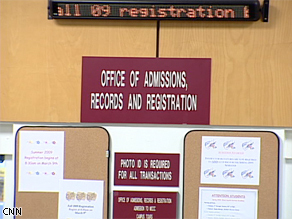 Applications for tuition-free courses have flooded in at Montgomery County Community College. The Pennsylvania woman was laid off in November after working at the same company for nearly 20 years. Now, as she looks for a job, McFadden worries about losing her home and uprooting her 8-year-old daughter. But when McFadden talks about the future, she has found some cause for hope. In January, the 43-year-old enrolled in the tuition assistance program at Montgomery County Community College in Blue Bell, Pennsylvania. The program offers county residents who have been laid off since September 2008 the opportunity to take 12 college credits -- usually four courses -- for free. McFadden said the program will allow her to reassess her options while she improves her marketability and salary potential. "I have all of the capabilities, but I don't have that piece of paper, which is a requirement for a lot of jobs," said McFadden, who is taking night courses in economics and English composition. "I never thought that I would go back to school, all this time, and I'm glad I did." She is one of more than 1,100 Pennsylvanians taking tuition-free community college courses as they search for a job. Many are concentrating on new job skills, such as computer programming and accounting, to retrofit their résumés so they can compete in a turbulent job market. "The response was incredible," said MCCC President Karen Stout. "The day after we announced the program, our call center lines were clogged up. We had more than 300 calls in the first two or three days, and we had information sessions that had standing-room-only attendance." It's a trend echoed at community colleges across the country. George Boggs, president of the American Association of Community Colleges, said he has heard from 75 college presidents reporting double-digit enrollment increases this semester. "Community colleges are a big part of the solution to this economic downturn," Boggs said. "We are the institutions that are on the ground bringing these individuals into our institutions and preparing them for a new career." Boggs pointed to programs in hard-hit industrial manufacturing states, such as Michigan, Ohio and Pennsylvania, as being particularly geared toward mid-career students. Many community colleges have cut or frozen tuition for laid-off workers, established scholarship programs or offered financial assistance to pay for textbooks and transportation costs. However, the spike in applications has put a burden on some schools that already are struggling to keep tuition low and upgrade their facilities. "Many [community colleges] are reporting that it is the highest-ever enrollment that they have had," Boggs said. "And several are reporting a waiting list of students that they can not accommodate. "It wouldn't surprise me to hear that about a half-million students are being turned away from our community colleges today." At MCCC, enrollment is up 10 percent since spring 2008. But the school has been able to place the new students in courses that aren't at capacity. "We are worried about our bottom line, especially in this economic environment," MCCC President Stout said. "But we do have classes that are scheduled to go that have open seats. So basically, these were empty seats that we're filling with unemployed workers." If unemployment continues to rise -- in Pennsylvania the jobless rate is 6.7 percent -- Stout wants to continue offering tuition-free classes. And even once these mid-career students get back on their feet, she's hoping to see them around campus still. "Our goal is that these students want to come back and be lifelong learners -- that they understand that in today's economy, you have to continue to keep your job skills relevant and up to date," Stout said. "None of us can be complacent about our own learning." Her plan may be working. Much to Janice McFadden's surprise, she has discovered she loves being a student. "I'm looking at it as a wide-open possibility for me. I don't have to stay in the same field that I was in, I can go back to school ... I can be anybody that I want to be now," McFadden said. "I just have to pick what I really like, what I'm good at, and concentrate on that."